Shadows will make look your artificial lawn more natural. 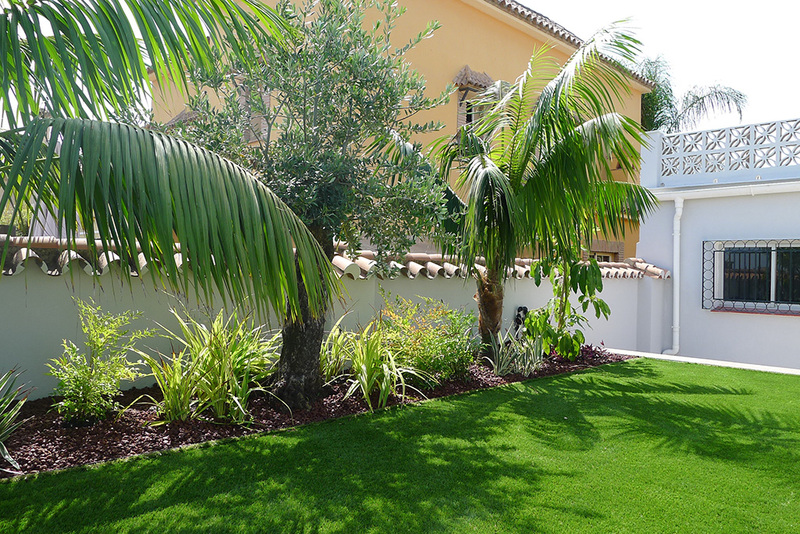 In this garden, we created shadows by planting olive trees and Kentia palm trees as well as Livistonia chinensis close to the grass area. The planting area soil is covered by little lava gravel to keep it clean and fresh. Nandina doméstica and Dianela tasmánica variegata and green provides the garden with some tiny movements in the wind, as painted with acuarell colours. They do look sad and ugly when you buy them at the garden center, but each year they will be more and more astonishing and give you joy during many years.